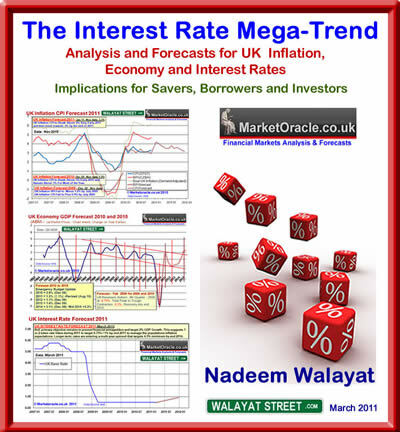 The New UK Interest Rate Mega-Trend 85 page ebook is now complete and available for download. The Ebook comprises of 4 chapters that contain full analysis and concluding forecasts for UK economy, inflation and interest rates, with the fourth chapter focusing on the implications of interest rate rises for society, housing, gold, silver, bonds and the stock market and comprises 4 chapters. Download Now- The Interest Rate Mega-Trend Ebook (PDF 2.2meg), the only requirement is a valid email address. My next in depth analysis of the stocks stealth bull market trend expectations for the remainder of 2011 is nearing completion, as always my primary motivation is with regards my own portfolio and trading positions, so I have to get it right else I WILL LOSE MONEY! I anticipate this work to be completed and formatted for publishing (including as an ebook) within the next 7-10days. Whilst my analysis is under way, readers still have a short window of opportunity (less than 24 hours) to download Robert Prechter's own stock market analysis and forecasts comprising of a 12 page ebook. Additionally Elliott Wave international has made available full access to their soft commodity services until Wednesday 23rd March that provides reports on the following commodities. Learn more and get instant access to EWI's commodity forecasts. Your mega-trends investing and stock index trading analyst.